Wednesday July 20th 1881 I feel better than yesterday and worked a little more on Mrs Barnes dress this morning. I began to chain-stitch a red skirt for myself in black. Father brought us a load of wood this afternoon. Mrs Reno and Flo and Abe Swisher and wife called here in the evening. Thursday July 21st 1881 I worked on my skirt what time I had Mother and May were here all the afternoon but did not stay till after supper I went up town as they went home. I did a little shopping and went to tell Mrs Angier that I would not be able to take my lesson tomorrow. 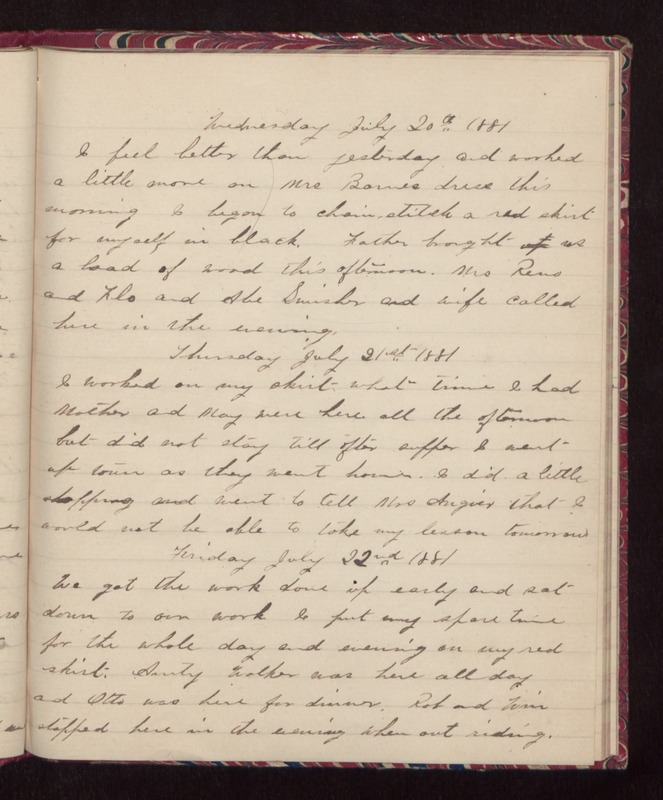 Friday July 22nd 1881 We got the work done up early and sat down to our work. I put my spare time for the whole day and evening on my red skirt. Aunty Walker was here all day and Otto was here for dinner. Rob and Win stopped here in the evening when out riding.